Was browsing at Sasa looking for a new serum. All the serums that the SA was recommending was above RM 150 for 30 ml, which I feel is kinda expensive. Especially when I don't even know if it works! 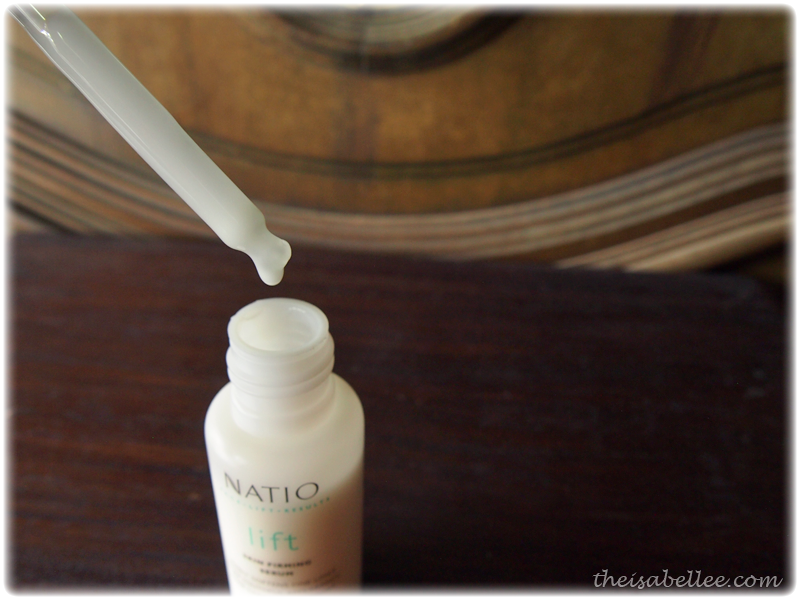 Then I saw this Natio Skin Firming Serum! RM 50 only for 50ml. It says..
Hydrating serum infused with botanical extracts and natural treatment oils for a more youthful looking appearance. Visibly helps soften fine lines. Gently firms and lifts the skin. Suitable for all skin types. Perfect under make-up. 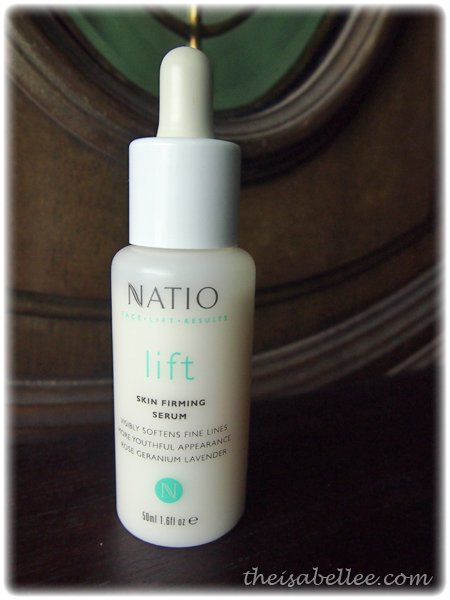 Natio products are natural and plant-based. Ingredients : Water (Aqua), Glycerin, Hydrolysed Soy Protein, Caprylic/Capric Triglyceride, Sesamum Indicum (Sesame) Seed Oil, Polyacrylamide, C13-14 Isoparaffin, Laureth-7, Phenoxyethanol, Methylparaben, Ethylparaben, Butylparaben, Propylparaben, Isobutylparaben, Fagus Sylvatica Extract, Vaccinium Myrtillus (Bilberry) Extract, Saccharum Officinarum (Sugar Cane) Extract, Acer Saccharinum (Maple Sugar) Extract, Citrus Aurantium Dulcis (Orange) Fruit Extract, Citrus Medica Limonum (Lemon) Fruit Extract, Xanthan Gum, Pelargonium Graveolens (Rose Geranium) Oil, Lavandula Augustifolia (Lavender) Extract, Styrax Benzoin (Benzion Tincture) Gum, Tetrasodium EDTA. Comes with a dropper but it doesn't reach all the way to the bottom. Thankfully, the product is liquid enough to be poured out. Despite it's milky appearance, it feels slippery and watery. It takes some time to absorb so I have to massage it for a good minute or two. 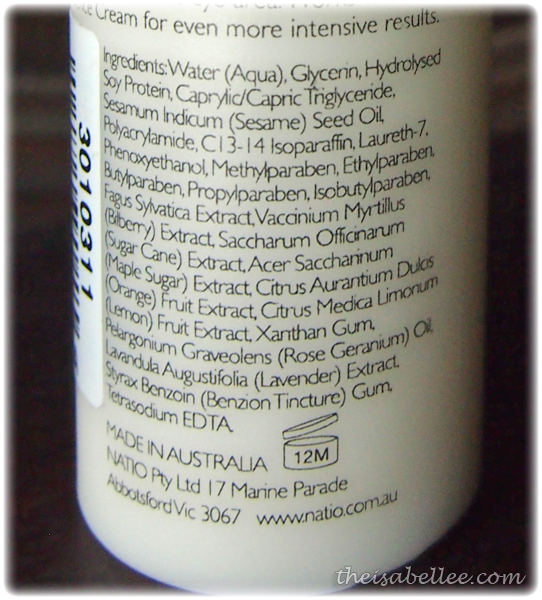 As for the scent, it smells just like the other Natio products - a very earthy smell. I didn't quite like the texture which took so long to absorb (it would just slide around). However, for RM 1/ml, the price is pretty affordable. If you're looking for a basic and cheap serum, you can give this a shot but I wouldn't put high hopes on the anti-ageing claims. I tried their milk cleanser and its pretty nice but their moisturizers and eye creams are not that great though. The only other Natio product I've tried is the clay mask and that was alright..